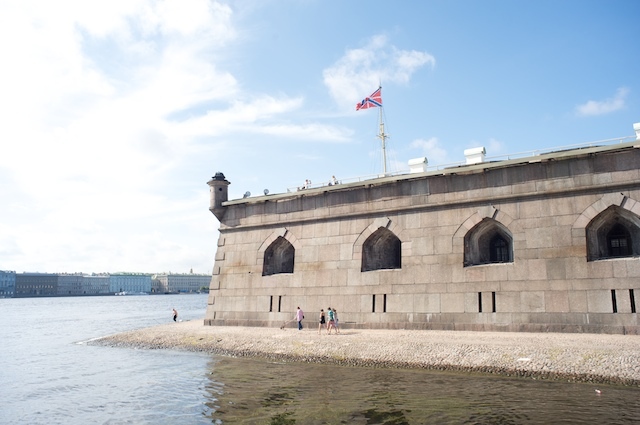 Today Sergey and Dmitri picked us up at 10 and took us to the Peter and Paul Fortress, which is an old fort on an island in the Neva river in the heart of the city. The fortress itself isn't much to look at, but it has a magnificent view of the most beautiful part of the city, and inside the fort is a church which, of course, is loaded with gold leaf and paintings and mosaics, etc. 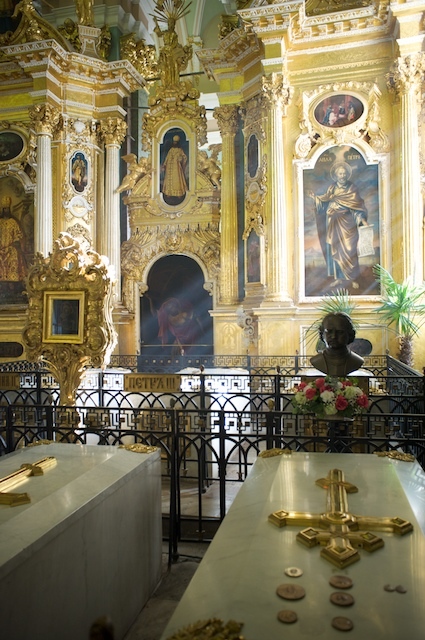 The most interesting thing is that the church contains the graves of almost all of the Russian Czars, including Peter the Great and Nicholas III (the last Czar, killed by the Bolsheviks) and his family, who were re-buried there after Perestroika. Russia seems to be becoming a religious country, which is willing to honor the aristocrats that they hated and ignored until recently. Sergey told us that the former Russian president, Yeltsin, attended the re-burial of Nicholas III and his family which was also attended by many living Romanoff family members. After the fortress, Sergey let us off for the day, so we asked Dmitri to drop us off at a large department store, where Donnie did some gift shopping - only for about 2 hours. Afterward, we had a quick lunch in a little local cafeteria. The staff spoke no English, but Donnie, in her usual way, just started speaking with them, and they figured out that they should give her an English menu. The rest of the communication was done via pointing. We then walked slowly back to our hotel on some back streets, avoiding Nevsky Prospekt, and we suddenly found ourselves in an area of little alleyways filled with tiny stalls whose goods spilled out onto the gritty, crowded streets. Some shops were underground with steep flights of stairs descending into the ground below, all selling cheap stuff. It was a permanent flea market area. It was very seedy looking, not as clean and safe looking as the rest of the city, so we walked through warily. We were dying to take pictures but decided not to take out our cameras. There were people who were obviously from different ethnic groups than the other St. Petersburg residents we had seen, and some were wearing ethic clothes. There were several women selling some kind of filled pastries out of baskets that they held. Lots of cheap clothing and shoes for sale, and lots of roughly painted signs. It was interesting, but after our recent unpleasant experience, a little daunting. Sergey had mentioned this place and had said we should be careful. We still wish that we had some pictures. We made it back to our hotel, after passing a Ukranian Restaurant which we had read about in our guide books, and we planned to try it for dinner that night, now that we knew where it was. We actually had to decipher the name from cyrillic because the name given in our guide book was in Roman lettering and the sign on the restaurant was cyrillic. The name in the guide book was Shinok, but the sign on the restaurant read ШИНОК. I should mention that I am part Ukrainian, but really have no knowledge of the culture. After returning to the hotel and resting our tired bodies and feet for a couple of hours, we decided (or, more accurately, our stomachs decided for us) to go out for dinner, and since the Ukrainian restaurant was not too far away, and since it was recommended by one of the guide books, we went in that direction. We found the restaurant again, and entered down a couple of steps, to discover inside a row of about 4 or 5 people greeting us, wearing what we could only assume was traditional Ukrainian costumes. The men were wearing red, baggy, satin pants and white baggy shirts with black vests. The women were wearing long, red, satin skirts, fancy multicolored blouses, vests, and headbands. We were shown to a table, and given English menus. The room was decorated with all kinds of agricultural artifacts, wheat sheaves, etc. and on one wall, what appeared to be the pelt of a wolf. While we were perusing the menu, suddenly the room was filled with live singing and music. Two of the costumed women who greeted us, and one of the men, were entertaining the diners with Ukrainian folk songs. The women sang and the man played the accordion. The music was obviously folk songs, and was very pleasant and melodic. The women had lovely voices and harmonized beautifully. They were slowly moving around the small room, when they came to a table occupied by a couple, who were enjoying the music very, very much. The couple gave one of the women some bills, and the singers and musician played for the couple for at least half an hour. The couple were obviously Ukrainian. The woman was singing along and smiling, and the man would applaud each song enthusiastically. Eventually the musicians left and we settled down to our traditional Ukrainian dinner. We both started with cold borsht (beet soup) which was delicious. Donnie had a chicken dish with tomatoes and cucumbers that was very prettily laid out on the plate. I had a stew which came in a small, decorated ceramic pot with a lid. Donnie's dish was excellent. Mine was a little bit bland, but with a bit of salt was pretty good. For the next course, we ordered Vereniky. Vereniky are filled dumplings like pierogi, or kreplach, or ravioli, or pot-stickers, etc. etc. I have to explain that my grandmother, who came from Ukraine, used to make Vereniky for me and my parents whenever we visited her. They were filled with potato and onion and were so delicious that I still dream about them. So we HAD to try the Vereniky at the restaurant, but I had to lower my expectations because I knew that there was very little chance that they would be equal to my grandmother's. So after our main course was done and the plates were cleared, the waiter came over and told us in heavily accented, but still understandable English that the Vereniky would take 10 minutes to arrive. We told him that this was fine. After 5 or 6 minutes, the waiter came to tell us that it would take another 7 minutes. After a minute or so, he brought over two shot glasses filled with a reddish-brown liquid and said it was a present, meaning that it was complementary. We thanked him and asked what it was. He said it was plum liquor. We tasted it, and it was more like a sweet plum wine, and was delicious. A few minutes later, the Vereniky arrived. I was pleasantly surprised. No, they were not good as Grandma Dora's, but they came closer than I had expected, and we enjoyed them very much. When the check came, there were two more glasses of the plum wine. We protested but the waiter insisted, so I had another shot glass and Donnie had half of hers, which I finished. The plum wine wasn't very alcoholic so it had little effect on us. To sum up, our Ukrainian experience was surprising, fun and delicious. We walked back to the hotel, and collapsed. Tomorrow Sergey and Dmitri pick us up at 11:00 to take us to the airport, and we will be leaving St. Petersburg and Russia. Even with the unpleasant experience the other day, it was a fun, interesting, enlightening and wonderful week.